You will also require a screwdriver & hot glue gun. Start by assembling the stool legs & laptop table frame. 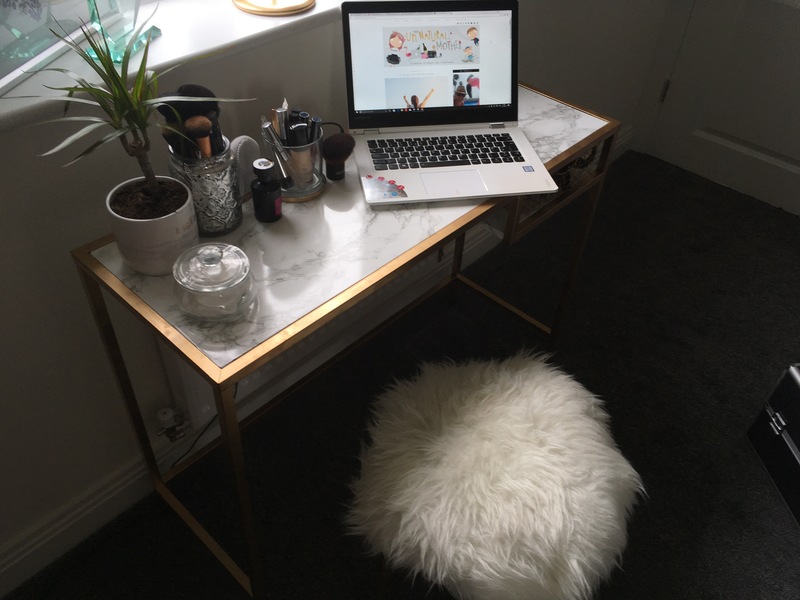 Don’t attach the stool seat or the laptop table shelf/glass top. Spray both frames with 2-3 coats of the spray paint, leaving 20 minutes between coats. Once the stool frame is dry attached the seat to the frame and hot glue the cushion to the seat. Allow to set & dry for 5 minutes. 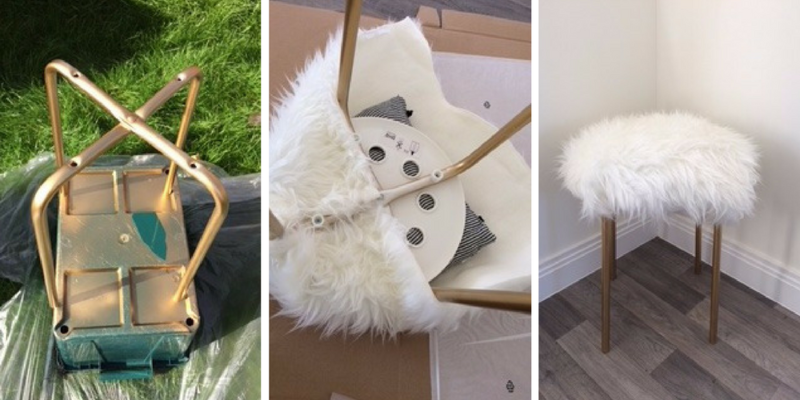 Turn the stool upside down on the fur material and measure enough material to cover the whole seat and allow enough overhang to wrap the material underneath. Turn stool back upright and fluff up the material. The stool is now complete. 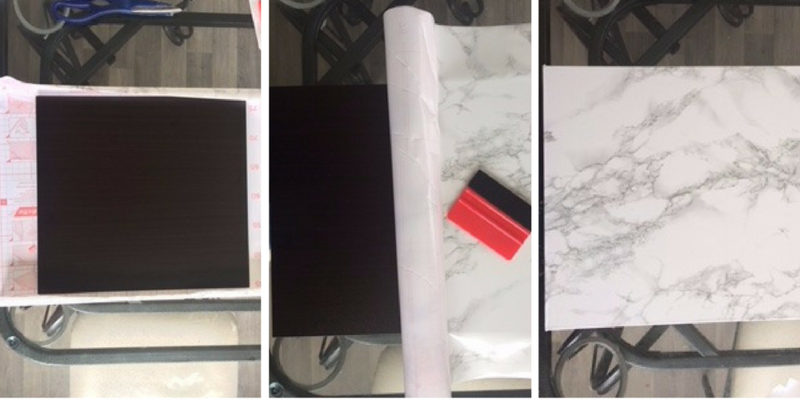 Take the wooden laptop shelf and place on the sticky back plastic ( DO NOT REMOVE THE BACKING YET ) and measure 10cm around the edge. This is the tricky bit !!! Carefully peel back a small section of the sticky back and attached to the wood.Smooth away any air bubbles with an old plastic store/credit card being careful not to rip the surface. Carry on peeling back and smoothing small sections until the shelf is covered. flip the shelf upside down and wrap the remaining sticky back plastic to the bottom.You may need to cut a couple of slips in the plastic to get it to lie flat. Take the glass top and repeat the same process as the shelf. Place the top on the table and fix the shelf into position underneath. 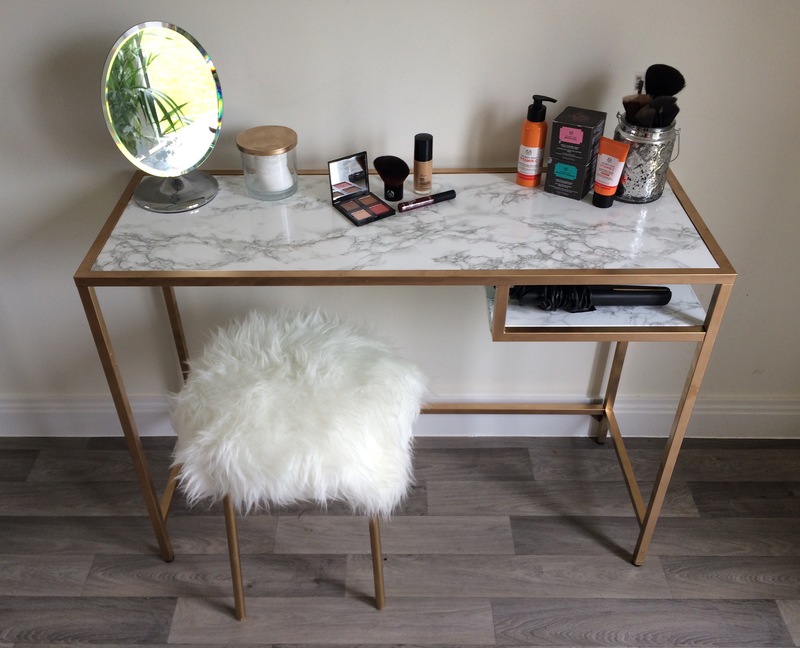 Add a mirror, pot of brushes & of course makeup and your DIY project is complete. 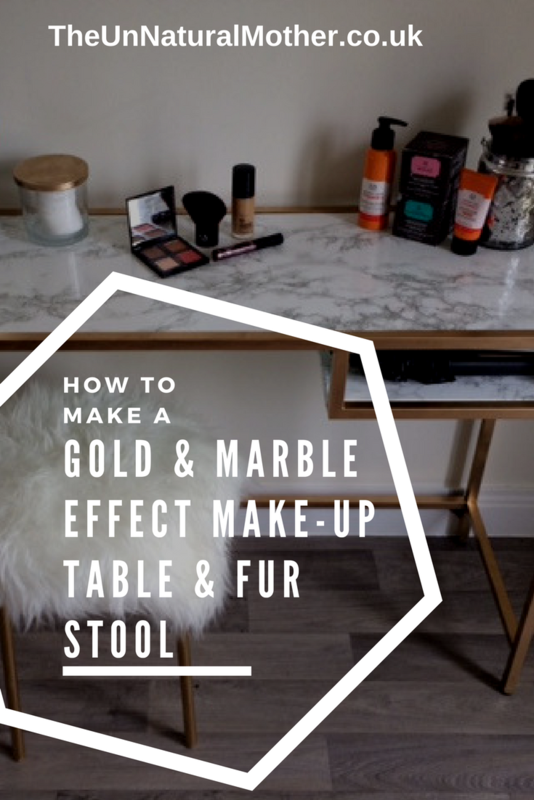 I hope this inspires you to make your own makeup table and reclaim a small part of your house. If you need some more inspiration then check out my Pinterest account here for some cool but cheap decorating ideas. If you would like to see some more decorating hacks then just comment below. This is such a great tutorial. Looks so much more than £60. I might do my own.